In today's video from Grand Princess' dry dock in Freeport, Martyn takes us to the engine control room which is still functioning throughout the drydock providing electrical power to the ship. He also shows us another important behind-the-scenes project being accomplished during the drydock. Grand Princess is being equipped to accept shore power in ports which provide it. Today's behind-the-scenes video from Grand Princess' drydock takes viewers to the upholstery shop, which is set up in the Vista Lounge. In addition to upholstery work, lots of other work is going on around the ship. What's happening today is detailed in Princess' photo journal, updated daily. The big day has finally arrived in Grand Princess' dry dock. Skywalkers Nightclub was lifted off the ship's stern this afternoon providing some spectacular video. Grand Princess now has a brand new profile. Want to see more? Princess' photo journal, updated daily, details more work being done on the ship. While Grand Princess is in drydock in the Bahamas, the crew works hard assisting the construction crew. They stay aboard the ship just like always, but they also get time off each day. In this behind-the-scenes video, Martyn shows us what arrangements Princess has made for the crew members' time off. Tomorrow, Martyn promises a big day. That's the day Skywalkers Nightclub will be lifted off Grand Princess, and he promises some spectacular video. The construction hasn't stopped. You can see some of the work going on today on Princess' photo journal. Although there's still a lot of work to be done, Royal Caribbean's new Falmouth port in Jamaica is now open. In this video, Royal Caribbean executives discuss the new port and why it's beneficial to passengers. The execs in the video also give potential passengers an overview of what's available nearby in Falmouth and easily accessible elsewhere in Jamaica from the port. Even though there are no passengers aboard Grand Princess while it is in drydock, the crew and the construction workers are aboard, and they still need to eat. Today Martyn shows us the culinary operation that is still in full operation during the drydock. Cunard's retiring Commodore, Bernard Warner, ended his career this morning when Queen Mary 2 arrived at Southampton. He is shown at left docking the ship for the last time, and a film crew was on hand to document the event. A new commodore has not yet been appointed, but like Elvis, Commodore Warner has left the vessel. 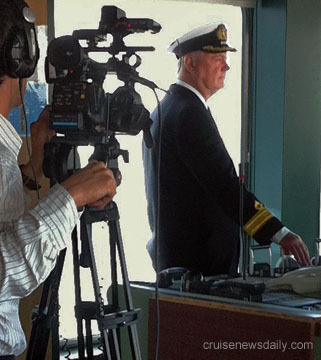 This week Cunard president Peter Shanks added this video tribute Commodore Warner's career to his blog. In today's video from Grand Princess in the drydock, Martyn takes us on a whirlwind tour to update us on the work that has been going on in several areas where it has been a few days since we looked in. Included in the tour are the atrium/piazza and the new venues surrounding it, the Crown Grill, the casino, as well as the new seaview suites. You can get a more detailed view of each day's work in Princess' photo journal. In today's video, Martyn takes us to Grand Princess' spa and Youth Center to see the work being done there during the vessel's time in the shipyard. Each day Princess takes you farther behind the scenes in their photo journal with more detailed views of the day's work.